病院 《★【用法】 入院・退院の意味には，通例 《主に英国で用いられる》 では無冠詞，《主に米国で用いられる》 では the をつける》. be in [out of] (the) hospital 入院[退院]している. go into [enter] (the) hospital 入院する. He was sent to (the) hospital. 彼は病院に送られた[入院させられた]. I have been to the hospital to see a friend. 友人を見舞いに病院へ行ってきた. The doctor comes to the hospital every other day. あの先生[お医者さん]は 1 日おきに病院に見えます. We must send her to hospital at once. He had to go to hospital for treatment. ¶Hospitals today admit patients for treatment. 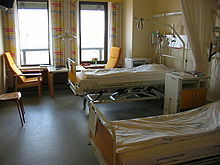 From Middle English hospital, hospitall, from Old French hospital (Modern French hôpital), from Late Latin hospitālis, hospitāle (“hospice, shelter, guesthouse”), from noun use of Latin hospitālis (“hospitable”), from hospes (“host, guest”). Doublet of hotel and hostel. A large medical facility, usually in a building with multiple floors, where seriously ill or injured patients are given extensive medical and/or surgical treatment. A building founded for the long-term care of its residents, such as an almshouse. The residents may have no physical ailments, but simply need financial support. (obsolete) A place of lodging. At last the Ocean, that hospital friend to the wretched, opened her capacious arms to receive him; and he instantly resolved to accept her kind invitation.